Medicine Ball Relay: On a flat surface, line up 2-4 start/finish cones, approximately one cone per 6-10 children. Add 3 cones 10 feet apart from each other and the start cone in each line. Align one 4#-6# Dynamini medicine ball to the side of each cone (not including start cone). On trainer “go” the first child in each line will perform three squats and then run to the first ball pick it up and return it to the start cone, repeating at all three cones. The next child will return each ball to its original location. Advise athletes not to begin until the person in front of them returns to the start cone. This is performed as a relay race, the first team finished wins. Musical Medicine Balls: Count kids and use one less medicine ball than there are athletes. Align medicine balls about 18 inches apart in a straight line. Create an oval of cones surrounding the medicine balls. Kids perform movement, burpee broad jumps, lunges, alligator crawl, skipping, lateral plank walks, forward rolls, as designated by trainer each time the music begins, moving around the cones. When the musicstops kids rush to medicine balls and get into the squat position over (not sitting on) the medicine balls. One medicine ball is removed each round and one child is out each round. Children who are out can be asked to perform similar exercises on the sidelines. 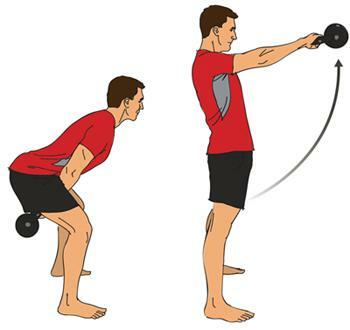 In the case of a tie, a “squat off”may be called: max squats in 30 seconds. Play progresses until only one child is left. As soon as the Assault Bike/Concept 2 is available, the next teammate jumps on and starts his/her 20 cals. Kids have a partner and play patty cake game-upon finishing the partners run a lap around a designated area. *Choose a load for the Hang Power Cleans that you can keep unbroken, but that will be extremely challenging in the later rounds.